It almost seems like something from Jurassic Park. 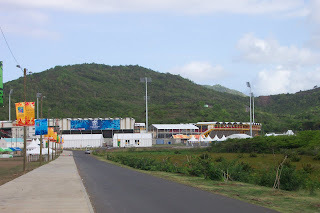 It seems bizarre to see a cricket stadium dropped into the middle of the bush five miles inland from St Lucia's coast. What's more, cricket has never really been that popular here. the island was British for many years but it was originally French. The local Patois/Creole is French based. New roads have been built just for the World Cup and it's hard to see how everything can be maintained after everyone leaves.